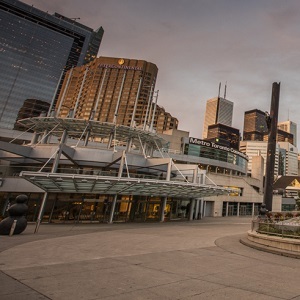 The Metro Toronto Convention Centre (MTCC) has received The Outstanding Building of the Year (TOBY) Award and Certificate of Building Excellence in the public assembly category by the Building Owner’s and Management Association (BOMA) of Toronto. The honours recognize facilities with the highest levels of quality in several categories, including energy conservation, building performance, security standards and community impact. “We constantly look at how technology can improve our operation and our customer experience,” said MTCC operations vice-president Vince Quattrociocchi. The LEED Gold-certified MTCC was the first convention centre in Canada to offer clean renewable power. It continues to reduce its environmental footprint every year by diverting 90 per cent of event waste from landfills and implementing successful strategies to reduce energy and water consumption. Low-flush toilets have been installed in all of the MTCC’s washrooms. Most of the building’s lamps have been retrofitted to energy-saving LED technology. The MTCC has partnered with Bullfrog Power to use green renewable energy and to offer the same option to its clients’ events. There’s an herb garden and five hives with 50,000 honey-producing bees on the roof of the MTCC’s south building, which recently received a BOMA Canada Platinum level certification based on a 93 per cent score in categories including energy conservation, waste reduction, indoor environment and environmental management systems. Ornamental flowers on the MTCC’s exterior have been converted to local species, requiring less maintenance and water. Clients are offered “100-mile meals” using locally grown and produced products. “As building operators, we all have a responsibility to try and operate buildings as efficiently and sustainably as possible — be it a massive energy conservation initiative or just chipping away at reducing waste to landfill,” said Quattrociocchi. The MTCC partners with Red Door Family Shelter, Habitat for Humanity and the Toronto District School Board‘s Arts Junktion program to donate various materials. It provides approximately 19,000 kilograms of food to local organizations, including Margaret’s Housing and Community Support Services, Second Harvest and the Toronto District School Board’s nutritional program. The MTCC received the 2016 Canadian Association of Exposition Management’s Give Back Award for its corporate social responsibility program. The MTCC is Canada’s largest convention and trade show facility, with more than two million square feet of space. The crown corporation of the Province of Ontario has hosted more than 18,000 events, entertained more than 55 million guests and added $5.1 billion in direct spending to the community since its north building opened on Front Street in 1984. The south building opened on Bremner Boulevard 13 years later.